Q: What do Wreckerators do when they lose their bakery jobs? It pays better, and there are a lot fewer complaints. Elissa R., does Tomb Wrecks know about this? Update from John: For those of you crying "Photoshop:"
This is clearly cut in the stone; look carefully at the S in both words. We also have Elissa as our eyewitness, who took this pic with her own camera while standing in the graveyard. I guess, "If you wreck it, they will blog" eh? Are you kidding me?!? It's so much worse in stone, and more permanent. A. I can't believe someone actually KEPT this. B. Truly sad for a veteran's final resting place. C. A cake will disappear after time, at least. Written in stone - hard to dispose of, gloss over, or scrape off. Thanks for an interesting site link... amazing what's on the 'net! wv - bitted --- I bitted my tongue when I read this one! Ooooh! It's going to take more than a rubber spatula to get THAT one out. It could only be more awesome if someone tried to chisel flowers over the last two words or something. Still trying to get my jaw off the floor. Don't you think that would have gone through a review by someone before it was placed? I sure hope the family (and the soldier) has/had a good sense of humor! 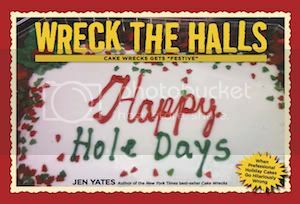 Just curious, Jenn, if you saw their shout out to cakewrecks? It's a classic. But, you know, engraved in stone and to be kept for all time for people to remember you by. Please tell me this was photoshopped. I kind of like it. I've always said that I want my gravestone to say something ridiculous. With glitter. Maybe you could use the "sprinkles" trick with flowers in this case? I was going to say something about how long wreckage has been going on until it occurred to me that the marker is fairly new. Thus, I can continue to cherish the thought that common sense hasn't always been an oxymoron, along with the secret doctrine that 2+2=4. What else lurks in the blogosphere -- Cave Wrecks? Where exactly is "script" and how mmany soldiers served there? That does look 'shopped to me. 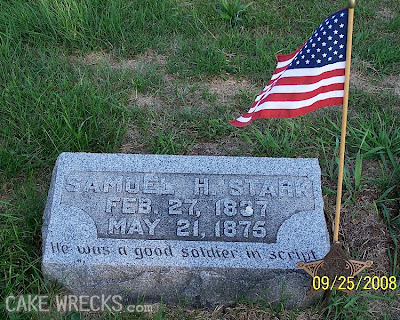 And you would think that Iron Man wouuld do something to fix his great-great-great-grandfather's tombstone. WVW: ativzn. Describes natives who are both dyslexic and poor spellers. I cannot believe this. This is both the most tragic and most amazingly awesome thing I have ever seen. Awesome site, and mentions CW more than once!! Those who haven't, should check out the Tomb Wrecks. They're not all new 'flubs'. Jen, are you and Steph twin sisters of different mothers ? Craig says it looks like a new stone, but having spent way too much time in cemeteries, I say is is original to 1875. The style and lettering is of that period. If they bought a new stone, I'm sure it would not have the time consuming reverse lettering. Which is why the error is so ... so ... very wrong. How about we make some concrete roses and glue them in the corner? Looks photoshopped to me (that really isn't "script", more like italics) but still funny! Is it bad that I didn't get it right away!? :( I guess I wouldn't EVER think that someone would actually accept it like that! BUT boy did I laugh when I did get it....if that makes up for my blond moment. Crap. I have to say it. There are fewer complaints. Glad I got that out. Is it possible they were referring not to the font, but to 'conscript'? http://en.wikipedia.org/wiki/Conscription . That would make a lot more sense. Hate to say it... please don't make fun... but, I don't understand the wreck here. Help me out? I'll go along with the stone itself being authentic, but the line in question is what I was keying on. I used the browser's zoom function to enlarge the image to the resolution limit and the 'engraving' on the bottom line shows no weathering defects such as are seen in the engraving above. I scarcely think someone would have added the last line to an existing stone, so that leaves Photoshop as the likely explanation. Nice try, though. I thought the same as Steph and Mike-- a colloquialism for conscripted, i.e. "He was a good soldier even though he was compelled to serve". Anyway, that's more interesting than crying "shopped!". If it said "He was a good soldier in pink" would it make sense? Oh boy.. now they add tombstone evilness to their wrecking ways.. way to go tomb wreckers lol. WV - dedjar - it's a cheap urn. What if he was a writer? He could have done his service to the country by writing, and maybe that's what it means. no no no no no no no no no!!! 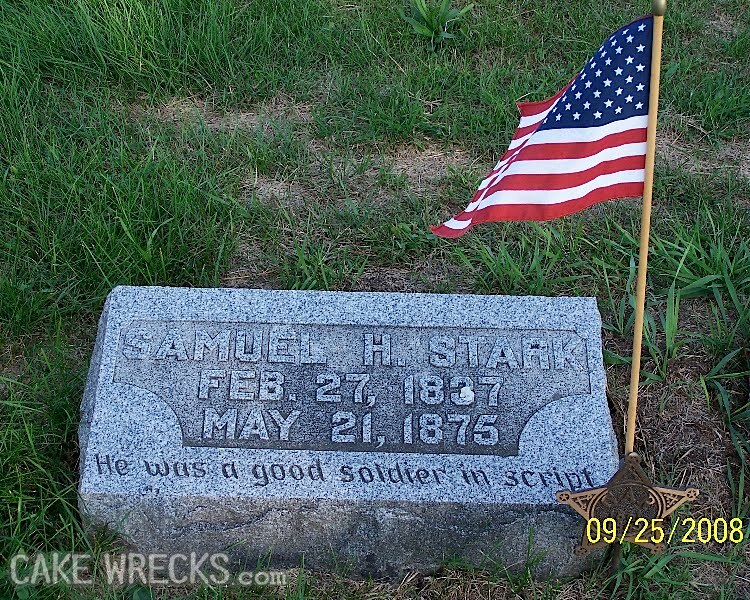 Hate to ruin everyones fun here, but the term "soldier in script" is a perfectly acceptable term used in the 1800's. In modern terms he would be called an "enlisted" soldier. Ok, I just got home from a 12 hour shift and honestly had to look at this three times before I got it. That may be even more sad than the stone itself..... Maybe they can cover it with curling ribbon?? I wonder if his family wanted sprinkles as well? Now that I get the issue with this stone, I can't stop giggling. Still, it is a horrible thing to do to a soldier's memory and to his family. No matter the original intent, it's funny. You have to admit it's funny. is it true? ?are you serious??? Joyce, I'm with you. It's the grammar mistake I see most often on this site. Which, honestly, because there are so few, makes it really stand out. Dear Photoshop Epcotters: it is insulting to Jen and John when you accuse them of not doing their job well. A big part of their job is screening fakes. They work hard to bring us funny but sad true stories of incompetence. No need to try to spoil it. Of course, don't believe everything you see on the internet. but this isn't the forum for crying "fake". I hate to be a killjoy, but my Dad owned several "monument' firms and I sort of grew up in the business. Cemetery markers go through so many appovals before they are set, that someone would have spotted this before it was engraved. Also, the line is question is not centered properly and that just wouldn't happen. So Elissa is really just messing with you. I come from a long line of Cake Decorators and they all double and triple checked their work. Therefore, no cake decorator will ever make a mistake. Therefore, all the cakes on this site are fake! I doubt this is a real cakewreck-style mistake. Could be a real marker documenting a colloquialism, or it could be a photoshop, but I doubt it's a mistake. The wife of author James Fennimore Cooper is buried under a large slab bearing a poem, on the last line of which appears the word "grteful", with a "^a" squeezed in. I'm sure the marker probably took days to carve, so I can understand the carver's desire not to redo the whole thing. Still, I found it curious that the carver did a crude correction which drew attention to the mistake, rather than simply leaving the word as "grteful". My very favorite tombstone (yes, I collect them) is one from about 1812 commemorating the resting place of Miss Lucinda Laird, daughter of Sam'l Laird. Sadly, the engraver forgot the I in Laird, rendering it as "Miss Lucinda Lard." And later went in and carefully inserted a tiny-wee caret pointing to a tiny-wee I in between the A and the R. That's a hell of a way to spend eternity. Have to comment, just because of my wv today. This stonecarver did not properly perform his duedy. After reading through Tomb Wrecks, it worries me how similar mistakes crop up on both cake AND gravestones. Oy Vey! I'm having to agree with the posters who have pointed out that "in script" is probably a colloquialism or short for "conscripted". Though, if viewed as a tomb wreck, it is also quite funny. Not buying the photoshop theory. I didn't get it either until someone explained it. It took me a LONG time to get it, and I'm still not sure...after all, the Civil War was, I believe, the first time that soldiers were drafted (or "conscripted," thus my ambivalence about the word "script." Maybe he was drafted?). Hey, don't poke fun. The "soldiers in script" were the most elite and badass unit in the Civil War! I do think that it refers to the soldier's having been conscripted, and not to the desired style of the writing. Although it does read funny to a modern eye. "Cemetery markers go through so many appovals before they are set, that someone would have spotted this before it was engraved." This is apparently not true of all monument companies. Two examples: My cousin's crypt marker had his last name misspelled "Railla" instead of "Failla"; and my brother-in-law's marker misspelled his last name "Belthis" instead of "Balthis". So whoever is "approving" them, it certainly isn't any of the family. WV: bumme... when they wreck your grave marker, it's a real bumme. I've made a pretty heavy study of the Civil War era, and I've never seen the phrase 'soldier in script' used in any contemporary accounts. To be sure, I googled it, and nothing material came up except this blog. So those arguing that it was an acceptable phrase of the time don't have a leg to stand on. And yes, gravemarker mistakes happen a lot - spend some time in cemetaries and you'll see. I simply thought it meant he was an actor who always played a soldier. . . . However it is funny now that I put it all together. Now I can imagine a tomb that reads "I want flowers" on it. So *that* explains the cake wrecks we see! They're all decendents of this stone carver! "I do think that it refers to the soldier's having been conscripted, and not to the desired style of the writing. Although it does read funny to a modern eye." Exactly. I wouldn't have known any of this so yeah, it looked (sadly) funny to me when I first saw it. At least it should provide a little levity in an otherwise 'grave' situation. Could also be that the deceased (and their family) had a sense of humour. I also remember an interview with Scottish comedian Billy Connolly a few years back when he said what he wanted on his tombstone. He said he couldn't decide between "See! Told you I was sick!" or "Good heavens! Is that the time already?" My husband was a stonecarver and, yes, doo-doo occurs. This one is pretty funny and I also googled the phrase and nothing came up in the historical records. Heck, even in our own family, when my father-in-law's stone, after we had spent hours designing it, was carved and set with a HUGE flaw right in the middle of his name. My husband tells stories of how he would be hired to fix "typos" in stones. It consists of filling in the bad word with a stone/glue paste and recarving it. A ton of this work was done to solve the "Y2K" problem when husband/wife stones were carved with the death date of the still-living spouse being pre-carved "19__" and that person having the utter gall of living past year 2000. PS: I ran this past my expert stonecarver husband and he laughed his head off. He's carved dozens of stones for veterans and repaired/replaced many more for old graves and he's never seen the phrase "in script." He thinks it is a legit tomb wreck done by an illiterate carver who was just reproducing the marks on the paper. Sunday Sweets Goes Back to the Future!